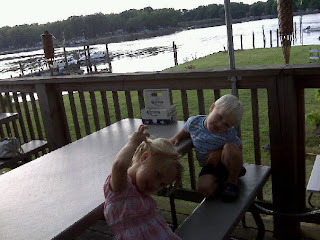 On a whim last night, because it was SUCH a beautiful evening, we took the kids down to the Island View Waterfront Cafe. We sat outside, drank a few beers (the grown ups! ), ate some tasty food, and just enjoyed the scenery and weather. My ILs came with us too which was nice and the kids enjoyed it. The kids were really good and after they finished we let them go down in on the lawn between the restaurant and the water and they ran around and had a great time. I feel so lucky to live in this area being so close to so many rivers and waterways and to be able to enjoy them. I remember the 2 years I lived in Ohio and was so far from any "real" water and realizing how accustomed I was to being so close to the bay. While I have my qualms about the area we live in from time to time, living in a community that is on the water and living so close to so many waterways is definitely one for the "plus column." We aren't boaters but I don't think you have to be a boater just to feel a part of the marine lifestyle. Nothing like having your choice of many nearby restaurants all having a variety of really good seafood too.